Scooper - Technology News: Why do people view the world so differently? Have you ever been in an argument that ended badly, after which you expected to receive an apology? Did the apology come or was the other side also expecting one? Have you ever done an audit or technical assessment and wondered how a team of professionals could have come to such seemingly erroneous conclusions? How can that be? How is that people can have such different views of the same thing? One reason misunderstandings occur is that people tend to be naïve realists . That is, we believe that we see social interactions as they truly are. Anyone else who has read what we have read or seen what we have seen will naturally perceive them the say way as we do… that is, assuming they’ve pondered the issue as thoughtfully as we have. In short, our own reality is true, so those who disagree with us must be uninformed, irrational, or biased. However, one of the most enduring contributions of social psychology is the understanding that two people can interpret the same social interaction in very different ways, based on their own personal knowledge and experiences. Tim Harford, the Undercover economist at the Financial Times, recently wrote about naïve realism, calling it the, “ seductive sense that we’re seeing the world as it truly is, free of bias .” He goes on to say that this is such an attractive illusion that whenever we meet someone that contradicts our own view, we instinctively believe we’ve met someone who is deluded rather than question our own rationale. 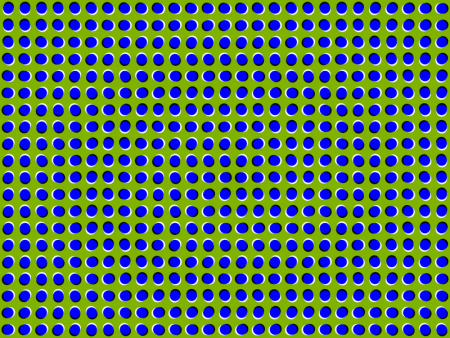 The dots are not moving, but appear to move because of the interacting color contrasts and shape position. According to Ross, our political beliefs are no different than these dots that aren’t really swirling. On most emotionally charged issues, there is no objective perspective that can be developed, despite the fact that people on each side of a debate believe their side is the one rooted in reality. In 1995, Ross co-wrote a paper with Andrew Ward entitled “ Psychological barriers to dispute resolution ,” in which the two scientists concluded that naive realism leads people to approach political arguments with the confidence that “rational open-minded discourse” will naturally lead to a narrowing of disagreement. The objectivity of their point of view will lead others to be persuaded. However, this confidence is usually short-lived because after listening to another's contrasting opinion, people are often not persuaded to change their minds. As a result, we assume there must be a rational explanation for why they think and feel the way they do. Usually, that explanation is that the other side is either not as capable of rational thought as we are or they are corrupted by a disreputable source of information, like cable news or a blowhard pundit. It is difficult to combat naïve realism because it is such an attractive illusion. It is also pervasive. Indeed, in international development, there are often competing viewpoints. Economists, anthropologists, scientists, communicators, and others may advocate for differing solutions to an issue depending on their field of expertise. Donors, international organizations, and local institutions may have contradictory opinions of how, when, and where a program should be executed. Naïve realism is also quite common when attempting to operationalize local ownership of a project: when the program does not achieve its stated objectives, one of the usual explanations offered is that local actors lacked political will and commitment. Yet, this assessment it does not take into account the self-interests and incentives of those local actors. Furthermore, political settlements in post-conflict and fragile partner countries are often contested, which means political will is fragmented at best and there is a natural struggle of self-interests regarding the direction of the policies. Nevertheless, there are a few methods that can be used to increase collaboration and acceptance of differing viewpoints. 3. Look for disconfirming information. We tend to look for facts that confirm our beliefs , that’s natural. This may lead to needless frustration as we assume events have occurred or opinions have formed based on information we have. Instead, force yourself to think about alternative viewpoints and when and where those viewpoints would be valid. This will also increase problem-solving and creativity.